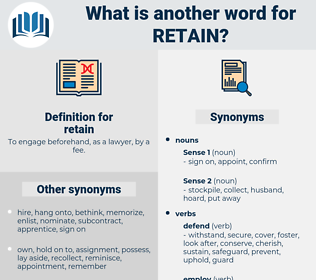 What is another word for retain? To engage beforehand, as a lawyer, by a fee. digging in to the past. are, stick, persist, enforce, hire. 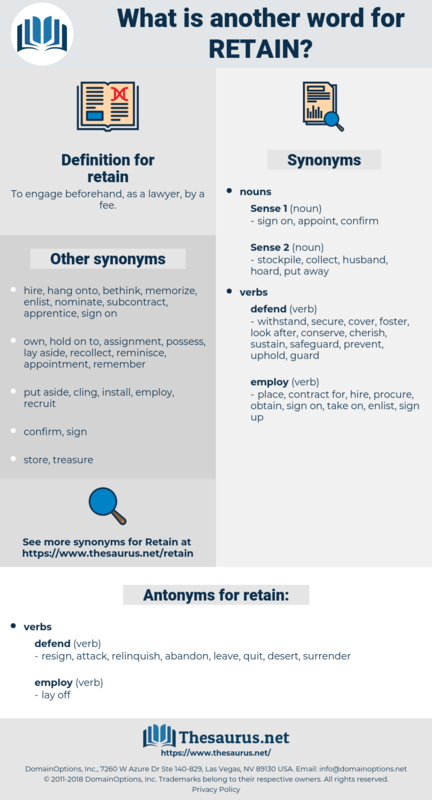 rent, restrain, withhold, safeguard, regain, recruit, contain, reinstate, entertain, restore, nurture, adhere, capture, stick, lose, persist, re-establish, enforce, defend, refrain, assert, hire, incorporate. preserve, conserve, Maintaining, retention, conserving. retained, preserve, conserve, sustain, Maintaining, retention, conserving. preserve, conserve, sustain, maintained, maintains. resign, attack, relinquish, abandon, leave, quit, desert, surrender. dismiss, discharge, expel, banish, eject, oust. spend, free, lose, let go, pass up. fire, furlough, can, require, release, decline, lock out, spurn, sack, dump, hand out, yield, ax. So that they can accept lower wages and retain our precious foreign trade. Experienced tourists tie a string to their teeth and retain them during the night. ready money, rodin, retinue, redeem, roadman, red onion, ratan, rhythm, radium, ruritanian, rhodymenia, ruritania, ruthenium, RETINA, radiation, red man, redden, retem, raetam, retinene, rotation, radon, rewrite man, rotten, radian, routine, red wine, rattan, radome, rotenone, retama, rhodium, ration.